We’d love your help. Let us know what’s wrong with this preview of Castles, Customs, and Kings by Debra Brown. From medieval law and literature to Tudor que An anthology of essays from the second year of the English Historical Fiction Authors blog, this book transports the reader across the centuries from prehistoric to twentieth century Britain. Nearly fifty different authors share the stories, incidents, and insights discovered while doing research for their own historical novels. To ask other readers questions about Castles, Customs, and Kings, please sign up. If you love English History but hate boring history books this is a great way to learn without being overburdened with boring. Good overview book but the essays are too short and don't go into enough detail for me. There was one very fascinating story about Thomas Cranmer's greatest achievement being the writing of the liturgy for the Church of England that is still used today - as it was put - Mary Tudor won the battle but Thomas Cranmer definitely won the war in that regard! 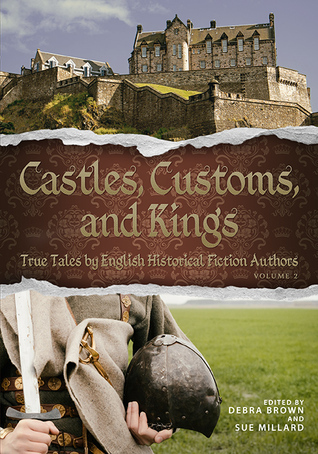 Several years ago, the English Historical Fiction Authors group decided to take some of the various articles and essays written by authors and compile them in one collective book called Castles, Customs, and Kings: True Tales from English Historical Fiction Authors. I thought that was a marvelous idea, as many of these blogs and essays and articles get lost in cyber space, and yet, are full of research and tidbits that are interesting and useful! Debra Brown and the now late M.M. Bennetts did a Several years ago, the English Historical Fiction Authors group decided to take some of the various articles and essays written by authors and compile them in one collective book called Castles, Customs, and Kings: True Tales from English Historical Fiction Authors. I thought that was a marvelous idea, as many of these blogs and essays and articles get lost in cyber space, and yet, are full of research and tidbits that are interesting and useful! Debra Brown and the now late M.M. Bennetts did a marvelous job putting them all together. This year, a voluminous second edition, now in memory of M.M. Bennetts, was released and the collection edited by Debra Brown and Sue Millard. This is a very large book to read at 600 pages, but it’s size is what makes it a great well-rounded collection to purchase to have on your shelf for a time you want to read a tale or two or use for research. Due to my limited reading time, I couldn’t quite get through all the stories in a few weeks, but I did get through many of them, reading a few every night, and I plan to continue on with that long after this review done. The essays are absorbing and played right into my inquisitive, history loving mind in all the right ways and offer a wealth of knowledge on all various sorts of British history. Many are delightful, some sad, some useful, some funny, many adventurous, and all fascinating. It’s easy to be swept away into lands far in time and place and to want to keep heading into the next essay after completing a former. The voices of these particular authors are very strong and captivating. Upon sliding to the first essay, I smiled to see the first was my friend Nancy Bilyeau’s essay about her dream coming true in flying to England during the research for her Joanna Stafford historical suspense series. It was the perfect essay to begin with as it encompasses the feelings most historical and fantasy readers have had in regards to being entranced by the worlds of Kings and Queens (and the lot) in our teen years. Didn’t we all wish to travel abroad? To see where the history happened we read about? It was fitting, her thoughts and evident enthusiasm, as this edition of Castles, Customs, and Kings is a way to do just that for those of us who can’t get back to England anytime soon to revel in exploring the history. This book allows us to steal into the history of England through words, until we can see her again, or for some, for the first glorious time. With a perfect set-up into the collection by Nancy’s essay, they came one after the other in their uniqueness or lesson. I have a few other favorites so far, such as An Anglo-Saxon Christmas by Richard Denning (an essay everyone of most religions should read) which tells us definitively how paganism and Christianity became entwined. It’s something I knew from studies, but it was a great essay that would teach quite a few people about the origins of Christmas. I love anything about the history of Christmas so I enjoyed this article, as well as the very last one at the end of the book about plum pudding! Now I want to make some! Being an advocate for women’s rights, and women’s history, I enjoyed Octavia Randolph’s Women’s Rights in Anglo-Saxon England: Why They Were Much Greater Than You Think. For women that don’t realize that before 1066 many women held great power and rights, this would be an excellent article. I also liked Randolph’s essay on Lady Godiva, which for all visual remembering of her, taught us that she was actually was a very rich woman. There are articles stemming from medicinal uses and cures to art, music, weather, military battles, monarchy, nobility, religion…basically, you name a period and subject of history and you’ve got some sort of set of essays to fit your desires. I especially liked how many author’s essays balanced each other or built off one another, sometimes probably without even the authors having planned it that way. The editors did a good job of balancing an array of technical and educational essays with others that were more for the historically curious and sometimes ticked the funny bone or were surprising and witty. Castles, Customs and Kings Volume 2 Have you ever wanted to know more about British history but you don't want to read a dry boring history book with data that you will never remember? Yes, me too. I love reading about British history, Tudor era especially. Castles, Customs and Kings Volume 2 is perfect, not only does it follow the first volume in that it kind of continues or actually contributes more to the reader. I have read both of the volumes now and equally impressed. The articles come fro Castles, Customs and Kings Volume 2 Have you ever wanted to know more about British history but you don't want to read a dry boring history book with data that you will never remember? Yes, me too. I love reading about British history, Tudor era especially. Castles, Customs and Kings Volume 2 is perfect, not only does it follow the first volume in that it kind of continues or actually contributes more to the reader. I have read both of the volumes now and equally impressed. The articles come from well known historical authors such as Sandra Byrd, Anna Belfrage, Nancy Bilyeau, Debra Brown, Stephanie Cowell and so many more. One of the things I liked about how the ebook was set up was the listing under each author's name for their websites, Twitter, Facebook and any other social media they contribute to. I think that gives the reader an insight into who their favorite authors are, all in one book. After the list of authors, about 50 of them, there is a section on the list of novels each author has written. Wow, that is one long list of books to read. I went through the list and there are quite a few that I have read, but there are so many more to get to. The book starts off with Pre-Roman to Early Medieval Britain (pre-55 B.C.-A.D. 1000 to Victorian Era and the Twentieth Century), now that is a lot of history covered. Within each section, the articles range from a glimpse inside a Roman home, The London Tornado of 1091, the Making of a Medieval Queen and The Lady's Monthly Museum. Once you get through all that there is another section called Historical Tidbits across the Ages. We learn about some castles such as Leeds and the Palace of Holyroodhouse, Witches, Midwives and Childbirth to Beds and Bugs through the Centuries. All of the articles within the covers of Customs, Castles and Kings Volume 2 come from the English Historical Authors blog. All impeccably researched and fun to read. If you love British History like I do, then this book needs to be in your library. An excerpt, Seven Surprising Facts About Anne Of Cleves by Nancy Bilyeau. The first two sections of the book are titled: "Pre-Roman To Early Medieval Britain" and "Late Medieval Period." The years cover 55 B.C. to A.D. 1485. These are my favorite periods to read about in British history, especially the period between the time the Romans left and until William the Conqueror's reign. Contributing authors of these chapters: Mark Patton, Richard Denning, Octavia Randolph, Rosanne Lortz, Lisa Yarde, Carol McGrath, Patricia Bracewell, Paula Lofting, Martin Lake, Helena P. Schrader, Arthur Russell, Scott Howard, Christy English, Nancy Bilyeau, Lana Williams, Antoine Vanner, Katherine Ashe, Judith Arnopp, Anne O'Brien, Anna Belfrage, and Anne E. Johnson. Multi-use book. The book can be read from cover to cover, read as a reference book, or in reading stories in history that are of interest. Engaging historical facts. "The Coligny Calendar And The Rhythms Of The Iron Age Year" by Mark Patton. In this chapter, I learned about the calendar for this era, including festivals, and the names and spellings of the months. "The Mission Of St. Augustine" by Richard Denning. In this chapter, I learned about Pope Gregory's quest to convert the English. He gave the task to Augustine, later he became Saint Augustine of Canterbury. I learned the order and progress of this history, but also Augustine's personality. "Alternate Histories of The Norman Conquest," Part One and Two (2 chapters) by Rosanne E. Lortz and Paula Lofting. In these chapters, I was given historical "primary sources" from both Anglo-Saxon and Norman. I felt this was a thorough teaching on a period in history that's difficult to interpret without bias. These chapters were some of my favorites in the entire book! Interesting character views. "A King, An Earl, And The Terrible Death Of A Prince" by Paula Lofting, and the two chapters, part one and two on the "Alternate Histories of the Norman Conquest." Edward the Confessor is an enigma. I prefer to read about mighty kings. Men of robust health and vigor. Men who fight valiantly. For example, Harold II and Oswald. Poor Edward, he did have a rough start, and his mother was not motherly, but instead a vixen. The sad tale of his brother Alfred left Edward bitter. Edward is forgivable, but not a favorite king to read about. Contrasting Edward with Harold II, and later Edgar Aetheling gave three polar views of kings. I loved reading these chapters. All of the characters in history came alive, even if one of them was a bit lumpy. Source: Free ebook copy from Historical Fiction Virtual Book Tours. This beefy volume of articles about British history, ranging from pre-Roman to 20th century, is drawn from the fabulous English Historical Fiction Authors blog. At close to 600 pages, this book anthologizes a whole year's content from nearly fifty authors, compiling their intriguing blog posts in chronological order. It's a welc This beefy volume of articles about British history, ranging from pre-Roman to 20th century, is drawn from the fabulous English Historical Fiction Authors blog. I have always enjoyed history, even when I was in school, history was one of my favorite subjects. However, I honestly never thought I'd open a book of over 500 pages and devour it in a few days. Not to mention the fact that this book is a compilation of British history broken up by period and each chapter gives a historical synopsis of each era. Even if you are a history buff like me, you might be put off by this book because it might appear to be like a social studies book. But let me put your I have always enjoyed history, even when I was in school, history was one of my favorite subjects. However, I honestly never thought I'd open a book of over 500 pages and devour it in a few days. 1. This book is told by each historical era so you don't have to read to this book cover to cover. If you only want to read about Henry the Eighths era you can turn to it and skip the first part of the book entirely. 2. "Castles, Custom's, and Kings was compiled by the English Historical Fiction Authors group. This group decided to take some of the various articles and essays written by authors and compile them in one collective book. To me this group has saved the history of all these stories from long ago. If not for groups like this one, we'd never know what happened long ago. 3. This is NOT a boring history book! Once you pick it up you'll see the magic I saw in this gem of a history retelling. 4. This book starts at medieval law and literature, and goes all the way to the true telling's of the Tudor queens and courtiers. 5 Each of the authors of this book contribute a completely different piece of historical literature to this book. All the authors told their tales well and I was never wondering about something that they might have missed. All the stories of the individual periods were told with authority and interest. Hopefully if you are a history buff or entranced by historical fiction like me, I have given you at least one reason to pick this book up. Enjoy. This is a BIG book! A BIG book of fascinating historical goodness. I have to admit that I have not finished this giant masterpiece. I'm taking my time, reading an essay or article at a time - and thoroughly enjoying myself. The amount of research these fantastic authors do always impresses the heck out of me. I am really finding it interesting the many things they come up with that don't end up making it to the actual stories they're writing. The way this book is compiled makes it easy to stop a This is a BIG book! A BIG book of fascinating historical goodness. I have to admit that I have not finished this giant masterpiece. I'm taking my time, reading an essay or article at a time - and thoroughly enjoying myself. The amount of research these fantastic authors do always impresses the heck out of me. I am really finding it interesting the many things they come up with that don't end up making it to the actual stories they're writing. The way this book is compiled makes it easy to stop and start and pick and choose whatever you're in the mood for reading at the time. One of my favorite parts of book reviewing is doing interviews with the authors and/or having them write guest posts for the blog. This book, along with the first volume, are like candy for me in that respect. I feel like I'm getting "behind the scenes" glimpses into the process in a big extra helping. The varying emotions that are evoked from many of these offerings were also a surprise for me. I pretty much hit the full range from sadness and tears to full belly laughs. Any lover or writer/wannabe writer of historical fiction needs to have this tome on their shelf. It is a fabulous reference as well as a place to go for an entertaining and informative look into the early times of Britain. Those who are just in search of some great stories to while away a winter's night will also benefit from getting this/these books. I wasn’t sure how I’d enjoy this one…but I was in good hands with numerous historical fiction authors whom I’m already familiar with; Stephanie Cowell, Nancy Bilyeau, Patricia Bracewell, Deborah Swift and many others. If you’re afraid that this is going to sound like a long academic read, put your worries aside! This is nothing like that. Each author included is a renowned historical fiction author and is not one to write a long, dull tome. My own doubts were silly and once I began to read, I fo I wasn’t sure how I’d enjoy this one…but I was in good hands with numerous historical fiction authors whom I’m already familiar with; Stephanie Cowell, Nancy Bilyeau, Patricia Bracewell, Deborah Swift and many others. If you’re afraid that this is going to sound like a long academic read, put your worries aside! This is nothing like that. Each author included is a renowned historical fiction author and is not one to write a long, dull tome. My own doubts were silly and once I began to read, I forgot them quickly. This is not a quick read, it is a massive 600 page book, but it is worth taking the time to read. Each author brings something different to the book, their own knowledge, their own voices. It is never dry or boring in any spot. History is often thought of as boring, but for those passionate enough about it; it is never that. It is fascinating and all encompassing. I lost myself in this book and I am certain that other readers and historical fiction buffs will feel similarly. Ranging from pre-Roman to the 20th century, there’s something in here for every history buff because, let’s face it, we all have a specific time period that we all seem more drawn to than others. (For me, it’s the Tudor period.) I very much enjoyed each era and the stories told. Extremely well researched and the variety of contributors gave greater interest to a long book. Debra cut her teeth on the Bookhouse Books, which created a nagging longing to live in a land of castles and wear flowing gowns and exquisite headdresses. Though life kept her busy, she was eventually able to do so vicariously through the characters of her books. Her first published novel, The Companion of Lady Holmeshire, is set in early Victorian England. Emma, a former servant girl, is chosen a Debra cut her teeth on the Bookhouse Books, which created a nagging longing to live in a land of castles and wear flowing gowns and exquisite headdresses. Though life kept her busy, she was eventually able to do so vicariously through the characters of her books. Her first published novel, The Companion of Lady Holmeshire, is set in early Victorian England. Emma, a former servant girl, is chosen as companion to The Countess of Holmeshire and dragged along into polite society where she is sure to receive a rude reception. Shortly after the first anniversary of the blog, an author suggested the creation of a book composed of select posts. A year later, to celebrate the second anniversary on September 23, 2013, Castles, Customs, and Kings: True Tales by English Historical Fiction Authors, edited by Debra and the late M.M. Bennetts, was released. Volume II will be released on September 23, 2015, and we hope to continue the series. You can chat with Debra about history and historical fiction and meet her author friends on Facebook at https://www.facebook.com/groups/21236... and at her Goodreads group, Historical Info for Historical Fiction Readers. Debra is the President of the M.M. Bennetts Award for Historical Fiction Association which honors the author of an outstanding novel each year with a $500 USD prize. Winners are announced at the annual Historical Novel Society Conference. Learn more at http://mmbaward.blogspot.com.